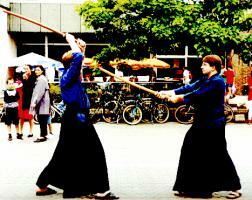 Tachi uchi no kurai is a form of kumitachi (paired sword form) practiced as part of Shinmei ryu and its branches. There is a seated set called Tsumi Ai no Kurai, but this is taught even less often than the Tachi set. The forms as practiced today are probably of relatively recent origin. Originally a lot more forms probably existed, and may have contained a jujutsu component. 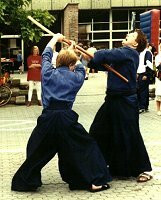 One cause for doubting the origins of the current set, is that it has few techniques in common with the Iaido sets of Eishin ryu. 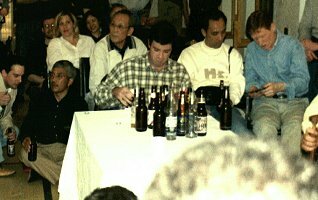 Omi sensei, Haruna sensei, Oshita sensei and Cruise sensei practicing kampai techniques. On formal occasions, you start and end with seated torei. This is like mae. Start with the right foot, take 5 steps. On the 4th draw the sword, shidachi cuts to the knee on 5, uchidachi blocks. Shidachi draws up the aft foot and threatens, steps forward with the right and cuts men. Keep the tip in the centre. Kiai: yaaaaa ei! To! Uchidachi draws back the right foot next to the left en goes to seigan, then steps back with the left foot and blocks (open block=hands to the left, tip points right). Both step back, starting with the aft foot, 7 steps ending with the right foot forward, yoko chiburi and noto (simulated using the left hand as koiguchi - putting it through the belt is not required), left foot moves next to right. 5 forward, 7 back, 3 forward, 5 back, the idea is that the steps back are smaller, and that you get back to the original spot. Don't get hung up on counting the steps. shidachi can't control the downward cut and smashes uchidachi's collarbone. Uchidachi steps forward in hasso, shidachi steps back in hasso. 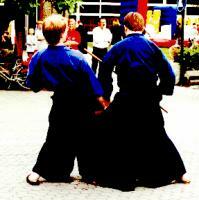 Starting with the left take 3 steps, on the 4th shidachi strikes right yokomen, stepping forward with the right foot. Uchidachi steps back with the left foot and matches strike. Repeat left. Shidachi steps forward, Threatens a tsuki, uchidachi steps back with left foot to jodan, steps forward with the right and strikes down on the sword. Shidachi steps with the left foot to the left, performs uke nagashi (move right foot to the side as well) and strikes to men. Both walk to the centre, then part. Uchidachi always moves back first. This is a feint, using split timing, uchidachi anticipates a 3rd strike and moves to jodan, but you tsuki instead. Start same but when uchidachi goes to jodan, step forward with the right foot and cut to the armpit; don't bend over, bend the knees instead. Shift slightly to the side, the left hand is held as high as possible, to protect the head. For those who do jodo, think kuri tsuke. Nice dramatic finishing posture. Some say shidachi moves back to hasso instead of tsuki. From hasso, uchidachi strikes shomen on the third step, shidachi started in gedan (first seigan, then gedan after uchi takes hasso) and performs rising block. Shidachi does not move back. Both shift forward and push with matched intensity, the tsuka together. Both step back to waki, uchidachi strikes for the knee (or do if close enough), shidachi changes feet and strikes men. (has some completely different variations) uchidachi starts hasso, shidachi starts chudan. Shidachi threatens, uchidachi cuts to the wrist, shidachi shifts back to the left, lowering the sword and bringing it up again in a U shape, shifts forward again and strikes men. Uchidachi �s strike should be a bit overcommitted. Shidachi starts in gedan, advances 3 steps and threatens, match strike, push tsukas together with the right foot forward. Shi is stronger and pushes uchidachi�s tsuka up with the power of his left hand using uchidachi�s wrist as fulcrum while stepping forward with the left foot and strikes uchidachi in the face with the tsuka. Both start from hasso, as in 3, But this time uchidachi is pushing shidachi backward during the strikes. shidachi blocks the last attack 90gr on the ha, supporting the mune with the left hand. Use the palm of the hand, not the thumb! 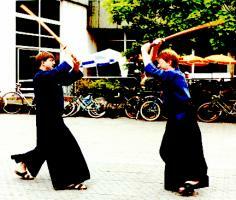 Shidachi then strikes uchidachi�s sword to the right using the hips, steps forward with left foot and performs soetetsuki. Uchidachi draws the sword, takes chudan, then jodan with the left foot forward, 3 steps starting left, then strike. Shidachi draws and blocks with 1 hand, grabs the tsuka with both hands, moves to the right pushing the sword down and to the side, then cuts the neck. (the cut is to the right of the neck with a big circle). Both in chudan, three steps in, pause, both cut and match blades, fight for centre as the blades come down, both release and step back to matching maai (tips).